Late last week I traveled from California to Reading, Pennsylvania so that I could, along with many like-minded supporters, witness/protest/provoke author Buzz Bissinger as he spoke at the Penn State Berks campus. I did this because if all of the media members who have been outrageously wrong in their commentary about the Sandusky scandal, Bissinger has been by far the worst. I wrote about why I feel that way in a previous post here. Because Penn State was so insecure about their outrageous decision to invite Biussinger to speak on campus and made it very clear that security was going to be off the charts, I had very low expectations for what could be accomplished. My primary goal was to simply make it clear that people knew that an outrage had occurred here and to perhaps provoke Bissinger into losing his legendary temper (which he did, though not as much as I had hoped). Before the event a bunch of us had dinner together and then to took a partial "team" photo with some great posters (using real photos) to greet the spectators as they entered the auditorium. As for my general impressions, I was honestly stunned at just what a horrible speaker Buzz was (we clearly had him rattled) and just how downright dumb his "arguments" were. At one point he actually proposed that the way to increase academics in big-time college sports by giving athletes the option of getting a salary the equivalent to their scholarship or going to class (gee, I'm sure that wouldn't do anything to dramatically decrease graduation rates!). It was also VERY obvious that his opinions are dictated almost completely, not by facts, but rather by his overt hatred of everything having to do with athletes/coaches being celebrated. About twenty of we "Joebots" gathered at Penn State Berks last evening to hear what H. G. "Buzz" Bissinger, author and so called journalist, had to say about the current state of college athletics, and in particular, big-time college football. It’s not that we really wanted to hear his position on the broader topic of college athletics. We were most interested in how he would tie Penn State, and in particular, Joe Paterno, into his thesis of college athletics gone awry. Aside from a few general negative comments about Penn State regarding the Sandusky scandal, Buzz for the most part refrained from casting much blame or aspersion directly at Joe Paterno. Of course, that was somewhat puzzling at first. But, as Buzz started to offer his opinion on what has gone wrong with college athletics, thoughts started firing in my mind about how the thorny issues he was describing could be solved, or better still, could have been prevented. It was Buzz’s own proffered litany of issues with college athletics that pointed like an arrow to the perfect blueprint for solving the entire mess. In fact, he spelled out the issues so perfectly; I’m starting to wonder whether he isn’t embarrassed about stealing the foundation of his thesis from a deceased former coach he so unfairly, and without facts, castigated in the public realm. 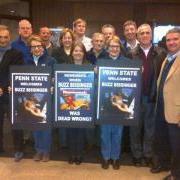 Yes, there’s the irony of the entire Buzz Bissinger thesis on college athletics vs. his opinion about Joe Paterno. Buzz wants to have his cake and eat it too! Buzz wants to admonish Paterno for fostering an insidious football culture at Penn State while at the same time prescribing everything that Joe stood for as the perfect blueprint for fixing the current state of college athletics. As Buzz progressed through his list of issues plaguing college football, it became increasingly apparent how closely Joe Paterno’s Grand Experiment would have provided a solution for every issue. Buzz started with academics, saying it has taken a back seat to athletics and wondering what place it has in a higher learning environment. Hmm, that sounds familiar to us Penn State fans. Wonder where we heard that before? Oh yes, it was from Joe Paterno! You remember; the guy who stressed academics first; the guy who graduated among the highest percentage of football players in the country; the guy who produced record numbers of academic All Americans and scholar athletes; the guy who asked the Board of Trustees for a library, academic funding and more academic support so that the academic profile of the University could be raised. Buzz also railed against high salaries for college coaches. Joe Paterno’s sentiments exactly! Everyone knows Joe was one of the lowest paid college football coaches in the country. In fact, he donated much of his wealth back to Penn State for a library and other academic improvements. Buzz kept laying out his thesis suggesting that college athletes should have balance, perspective and discipline. He said the limelight shone by the media, especially ESPN, is leading athletes to fantasies of stardom rather than the reality of the need for an education. All that sounds like it was lifted from Joe Paterno’s playbook for the development of his players and all college athletes. Joe preached balance, perspective and discipline. He bucked the system to the best of his ability, setting the expectation that his players succeed academically; providing tutoring and concerning himself with the physical and mental well being of his players. Joe also had disdain for the media. He knew the media created hype while at the same time having the potential to create enormous pressures of expectation. One of Buzz’s final points on how the current system of college athletics mistreats athletes had to do with high school players who are injured before they matriculate to the college game. He told stories of vaunted high school athletes who, after they were seriously injured, were suddenly forgotten and ignored by college coaches. The record shows that Penn State’s roster under Joe Paterno was filled with athletes who suffered serious injuries prior to signing their letters-of-intent to play football for Penn State. To my knowledge, Joe Paterno never pulled a scholarship offer due a player being injured. Regarding the players who ultimately signed to play under Paterno, one only needs to think of Adam Taliaferro and the extent to which Joe Paterno supported Adam through his injury, paralysis, subsequent recovery and promising legal career. Buzz closed to a round of applause from the young students in the audience who obviously share some of Buzz’s concerns and likely aren’t overly familiar with the life and works of Joseph Vincent Paterno. Those of us, who knew Joe and recognized the dripping irony of Buzz’s current view of Paterno relative to his thesis on college athletics, provided the dissenting boos. I wonder when it might dawn on some of the youth in the room that when they applauded for Buzz Bissinger they were actually applauding for Joe Paterno?